Odile Robotti is an Italian entrepreneur, social entrepreneur and author. She is CEO of Learning Edge/ Talent Edge, a training and HR consulting company which she founded in 2000 after work experiences at McKinsey&Co. and IBM. Odile, who is committed to promoting diversity and inclusion, gender balance in leadership and volunteering, is also founder and president of the Milano affiliate of Points of Light called MilanoAltruista, of the network of Points of Light affiliates in Italy called ItaliaAltruista, of the Milano affiliate of Dress for Success and of Kaumatua. She is country leader for the 30% Club Italy and author of the book Il Talento delle Donne on women’s leadership. 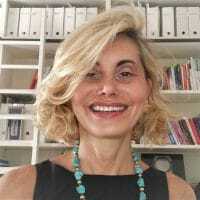 Odile holds a laurea in economics from Bocconi University (Italy), an MBA from SDA Bocconi School of Management (Italy), a Ph.D in psychology from University College London (UK) and is a certified coach (CPCP) of the International Coach Academy.